Put another way, home equity is the portion of your property that you truly “own.” You're certainly considered to own your home, but if you borrowed money to buy it, your lender also has an interest in it until you pay off the loan. Home equity is typically a homeowner’s most valuable asset. That asset can be used later in life, so it’s important to understand how it works and how to use it wisely. The easiest way to understand equity is to start with a home’s value and subtract the amount owed on any mortgages or other liens. Those mortgages might be purchase loans used to buy the house or second mortgages that were taken out later. Assume you purchased a house for $200,000, made a 20 percent down payment, and got a loan to cover the remaining $160,000. In this example, your home equity interest is 20 percent of the property’s value: The property is worth $200,000 and you contributed $40,000—or 20 percent of the purchase price. Although you're considered to own the property, you really only "own" $40,000 worth of it. Your lender doesn’t own any portion of the property. Technically, you own everything, but the house is being used as collateral for your loan. Your lender secures its interest by getting a lien on the property. Now, assume your home’s value doubles. If it’s worth $400,000 and you still only owe $160,000, you have a 60 percent equity stake. You can calculate that by dividing the loan balance by the market value and subtracting the result from one (Google or any spreadsheet will calculate this if you use 1 - (160000/400000), and then convert the decimal to a percentage). Your loan balance hasn’t changed, but your home equity has increased. Loan repayment: As you pay down your loan balance, your equity increases. Most home loans are standard amortizing loans with equal monthly payments that go toward both your interest and principal. Over time, the amount that goes toward principal repayment increases—so you build equity at an increasing rate each year. If you happen to have an interest-only loan or another type of nonamortizing loan, you don’t build equity in the same way. You may have to make extra payments to reduce the debt and increase equity. Price appreciation: You can also build equity without even trying. When your home gains value (because of improvement projects or a healthy real estate market), your equity grows. Equity is an asset, so it’s a part of your total net worth. You can take partial or lump-sum withdrawals out of your equity at some point if you need to, or you can pass all the wealth on to your heirs. There are several ways to put that asset to work. Buy your next home: You probably won’t live in the same house forever. If you move, you can sell your current home and put that money toward the purchase of your next home. If you still owe money on any mortgages, you won’t get to use all of the money from your buyer, but you’ll get to use your equity. Borrow against the equity: You can also get cash and use it for just about anything with a home equity loan (also known as a second mortgage). However, it’s wise to put that money toward a long-term investment in your future—paying your current expenses with a home equity loan is risky. Fund retirement: You can choose instead to spend down your equity in your golden years using a reverse mortgage. These loans provide income to retirees and don’t require monthly payments. The loan is repaid when the homeowner leaves the house. However, these loans are complicated and can create problems for homeowners and heirs. Home equity loans are tempting because you have access to a large pool of money—often at fairly low interest rates. They’re also relatively easy to qualify for because the loans are secured by real estate. Before you take money out of your home equity, look closely at how these loans work and understand the possible benefits and risks. 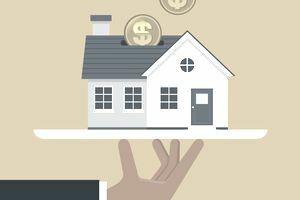 A home equity loan is a lump-sum loan, which means you get all of the money at once and repay with a flat monthly installment that you can count on over the life of the loan, generally five to 15 years. You'll have to pay interest on the full amount, but these types of loans may still be a good choice when you're considering a large, one-time cash outlay, like paying for a full rehab of your home; consolidating higher-interest debts, such as credit cards and personal loans; or buying a vacation getaway. Your interest rate is usually fixed as well, so there will be no surprising hikes later, but note that you'll likely have to pay closing costs and fees on your loan. A home equity line of credit (HELOC) allows you to pull funds out as necessary, and you pay interest only on what you borrow. Similar to a credit card, you can withdraw the amount you need when you need it during the “draw period” (as long as your line of credit remains open). For this reason, HELOCs are often useful for expenditures that can be spread out over a period of years, like minor home renovations, college tuition payments, and helping out other family members who may temporarily be down on their luck. During the draw period, you’ll need to make modest payments on your debt. After a certain number of years (10 years, for example), the draw period ends, and you’ll enter a repayment period in which you more aggressively pay off all of the debt, possibly including a hefty balloon payment at the end. HELOCs usually feature a variable interest rate too, so you could end up having to pay back much more than you planned for over the 15- to 20-year life of the loan. The major issue with either type of equity loan is that your home serves as the loan collateral. If you're unable to repay for any reason, your lender can take your house in foreclosure and sell the property to recover its investment. This means you and your family will need to find other accommodations—probably at an inconvenient time—and your home probably won’t sell for top dollar. Thus it's smart to avoid the temptation to use your windfall to splurge on fancy vacations, new clothes, big-screen TVs, luxury cars, or anything else that doesn't add value to your home. On the other hand, depending on how you use the proceeds of your equity loan, your interest may be tax-deductible. Before you start shopping around for lenders and loan terms, check your credit score. To obtain a home equity loan, you'll need a minimum credit score of 620; the minimum you'll need to qualify for a HELOC will likely be higher. If you can't meet the bar as far as your credit score is concerned, you probably won't be able to qualify for either type of loan until you repair your credit score. You must also show the lender that you're capable of repaying the loan. This means providing your credit history and documentation of your household income, expenses and debts, and any other amounts you're obliged to pay. Your property's loan-to-value or LTV ratio is another factor lenders look at when determining whether you qualify for a home equity loan or HELOC. You'll generally need to have at least 20 percent equity in your property, which means a minimum LTV of 80 percent. Keep in mind that the amount you can qualify for may be limited to 85 percent of your existing equity.